4/22/2019 6:45:55 AM - LIVE TOURS -- We have several dates confirmed in Japan for November in December in Japan, and are in the final stages of confirming dates in Jakarta, Indonesia in November. 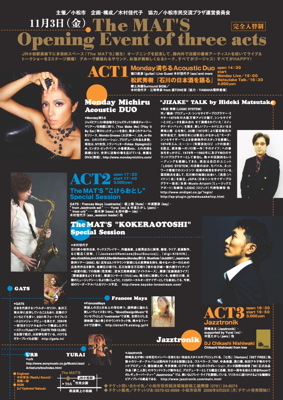 November 3 (Friday): THE MAT'S in Komatsu, 3:00 p.m. This is put together by my good friend and former band member, saxophonist Kayoko Kimura, in her hometown. Jazztronik, YMO's former manipulator Hideki Matsutake, and various other artists will be joining the day of festivities. Very exciting for me to be invited to Jakarta with my band, and while we have not 100% confirmed it (nothing's final 'til the contracts signed, dig?) it looks like it will be going forward. As the date nears I'll send another blast with more details. We're still finalizing this, but it looks like I'll be performing a duet with guitarist Higuchi-san in Tokyo. More info to follow. As many of you know, my mother disbanded her big band in 2003 with a finale concert at Carnegie Hall, but was asked to put together the band for a special reunion concert at Suntory Hall. She asked me to sing her tune "Hope" which someone has put Japanese lyrics to. My husband Alex has also been asked to fill one of the trumpet seats. Our third time performing at Club Ikspiari, I'm very flattered that they have asked my band back to help celebrate their 2nd anniversary. If you haven't been to this club, it's really worth a trip, located next to Tokyo Disneyland. The sound system is great, the room is comfortable with every seat intimately close to the stage, and the food and bar is pretty awesome as well. Is there a pattern here? If it's not the weekend, it's a Monday...hmmm....anyhow I'm honored that Blue Note Osaka has asked me to come back with my band. We will be performing in a small group setting or duet, not the band. There may be another date in Fukuoka during the December tour. I will send out another newsletter before these dates with more details such as website links, etc. I have been in talks with promoters in Poland, Italy, Korea and several cities in the U.S. Hopefully we'll get something going in these territories and others soon. OTHERS: I'm dying to do a new project, and am probably going to launch yet another original solo project with ArtistShare through my website. Please check in again in the Winter if you're interested in getting into the project from the start -- you will not only see the project unfold from start to finish, but also will be helping in realizing the project by your financial support. I am hoping to be able to get it going by December more or less. There are some collaborations in the works which I'll save for my next newsletter. Until then be well everyone and embrace the new season!